A few days ago I went to Kroger because I'd been forgetting to buy olive oil for weeks. This time, however, I had "olive oil" scrawled on my arm in block letters with black ink and I wasn't going to scrub it off until I finally remembered to buy some. We won't discuss the fact that "wash underwear" was penned on my other arm. I don't know if your grocery store is similar, but mine has an entire section with hundreds of varieties of olive oil with shelf upon shelf and rows upon rows of bottles of the stuff. The selection is overwhelming and the labels tend to blur together as I ponder the difference between pressed extra virgin and olive-pomace oil. How many refined virgins squeezed this oil, and why is it twenty dollars for such a small bottle? What does "cold pressed" mean, and are they still virgins afterward? How can virgins be fancy, and what does any of this have to do with olives? "Why didn't Paul Newman make frickin' olive oil, damn it!" I wondered aloud. I'm indecisive by nature, so whenever I'm faced with a food dilemma, I look for the Newman's Own label. I've never heard of a Newman's Own product recall before, their stuff always tastes good, and the proceeds go to charity, so it's a win all around. As soon as the words left my mouth, I spotted a label with Paul and Nell Newman posing a la American Gothic. 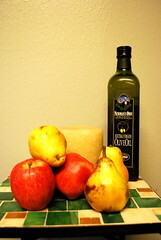 "Newman's Own Organic Extra Virgin Olive Oil. Ask and ye shall receive. Sweet!" Last May, when I went to the Saints & Sinners festival, I weighed 165 lbs. when I left for New Orleans. Somehow, when I arrived back in Houston I weighed 158 lbs. I was flummoxed, because I was eating constantly and not working out at all while I was there. My metabolism is so fast that I lose weight if I breathe too quickly. This is usually where people's eyes glaze over or start spinning in their sockets whenever I discuss my point of view on the topic of weight. Don't worry, that's all I'll say about the horrors of being thin. The point is, that's where I realized that I should be a bit pickier about what I eat. It's one thing to ramp up my caloric intake to try to pack on pounds, but would I feel better having a Big Mac or grilled chicken breasts, broccoli, and an apple? Which is more refreshing, a bottle of Dr. Pepper or a bottle of water? Should I snack on Cheetos, or should I snack on a mix of pumpkin seeds, sunflower seeds, and almonds? For dessert should I have a pint of ice cream or the recommended serving of sorbet? The answers to all those questions are obvious, but I've been eating the healthy stuff anyway and my weight has been a consistent 165 lbs. as I replace fat with muscle. I definitely feel a lot better and I attribute that to paying attention to food labels. If the label has more than ten ingredients, I look for something else. If there are things in the ingredient list that can't be found in nature (barring L-ascorbic acid, aka vitamin C), or are better left for spelling bees (Azodicarbonamide? Gesundheit! ), I look elsewhere. But I still eat pints of ice cream. (Thank you, Lactaid pills!) Haagen-Daaz's Five line is a great example of what I look for in food now. Why should it take more than five ingredients to make ice cream? After I found my olive oil, I thought, I don't eat enough fruit, so I went to the produce section. Scary! Have you looked at fruit lately? Most of it looks as though it should be polished with Pledge and used as decorative art, rather than eaten. The Red Delicious apples looked waxen and the chemical coatings looked anything but delicious. I scrutinized the tiny labels and realized the kiwis, plums, and peaches had flown farther than I ever have. Shouldn't food with such a short shelf life be grown a little bit closer to home? I realize Texas isn't the kiwi capital of the produce world, but the USA does grow lots of other stuff I was looking for. Then I saw the organic fruit section. The pears looked as though they'd recently fallen from trees. The apples had a natural sheen and were a red with yellow-green highlights that could only be found in nature. This was the fruit I remembered from my childhood, freshly picked and locally farmed, sans chemicals and additives. Bruised skin never looked so good. And now I want lunch.